While there's a lot to be said for bold and striking architecture, sometimes style and simplicity can make the happiest of marriages. 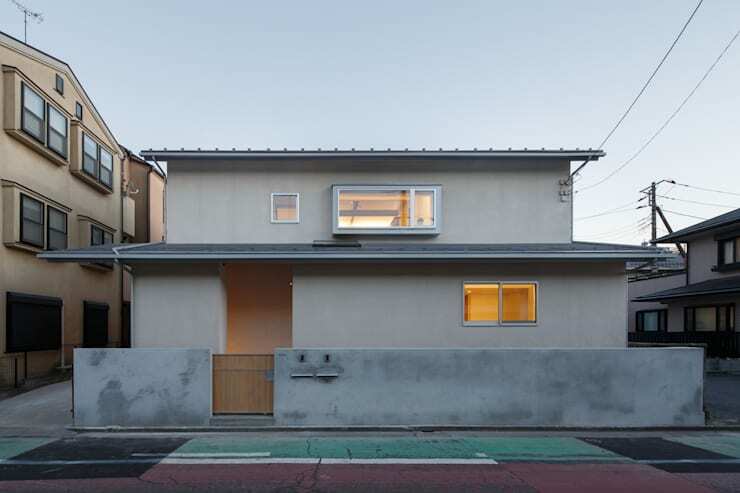 So it is with this next property, brought to us by Tokyo's atelier SPINOZA Architects, which rests in understated glory as a series of sleek, grey layers. From the outside the home appears humble and compact, with its cool, grey exterior standing out from the street, while a lofty and light living space glows from within. Upon entry we're embraced by a sea of white and wood, with this classic combination prevailing throughout the decor. Contrasting timber tones and vintage furnishings add a sense of character, while the classic elements of Japanese design are present in the bedrooms and back garden. Moving up to the second floor and we're met with another spacious level, housing a second kitchen and cosy, private courtyard drenched in sun. Perhaps most intriguing in this unique dwelling however, is a range of sectioned rooms finished in the moderately rough texture of chip-board. These spaces present a multi-functional departure from the home's wood and white decor, with the chip-board even making its way up to the apex of the property to construct a small attic to be used for storage. The exterior of this home is sleek and stylish in layers of cool grey, with the warmth of its interior glowing from within. A small, concrete fence borders the abode, with a modest, wooden gate inviting entrance in traditional style. An understated, two-story home has been constructed beyond, exuding a contemporary edge amidst the surrounding neighbourhood and, while its facade appears simple, it houses an impressive interior. Upon entry we're embraced by a spacious dwelling with high walls and lofty ceilings. The home's decor comprises the classic combination of wood and white, with timber floor flowing throughout, and wooden adornments also seen in the sturdy ceiling beams and unique furnishings. To the right is a sleek, modern kitchen, bordered by an ornate, vintage cabinet, creating a beautiful and instriguing aesthetic blend within an otherwise sparsely decorated space. The home's bedrooms exude classic, Japanese design, with the pale green of their fabric flooring immediately creating a soft atmosphere. 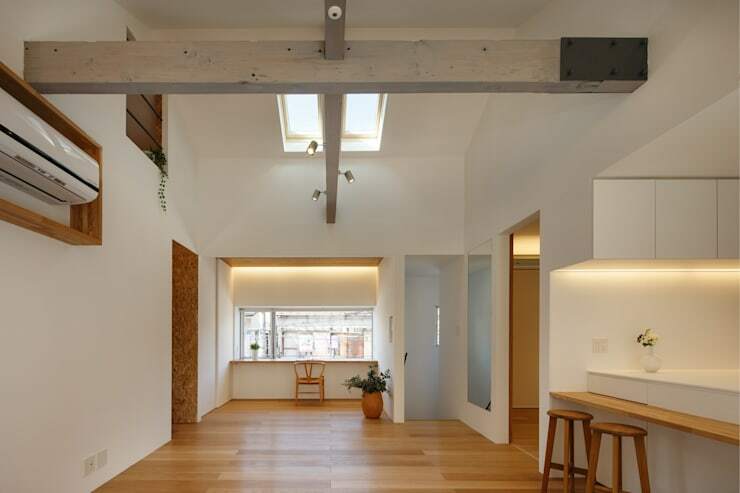 Timber-finished ceilings balance the softness of the floor and carry through the prevailing decor of wood and white characterising this lovely dwelling. 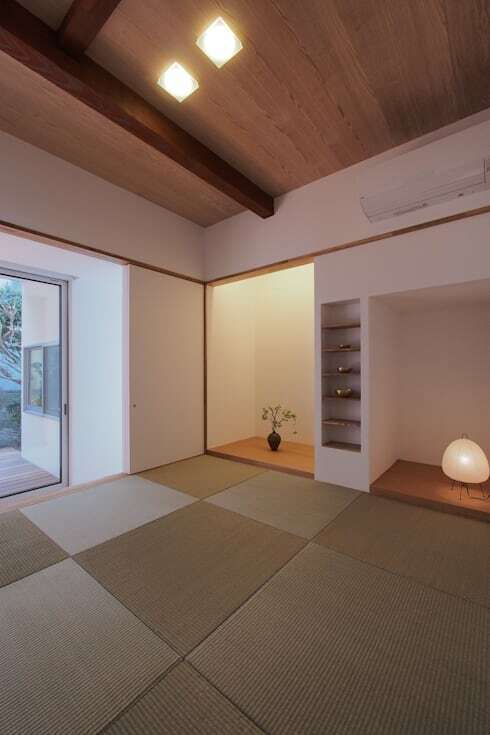 This room appears open and inviting, with plenty of storage included in built-in shelves and alcoves, and a generous amount of light flowing in through the home's rear courtyard. 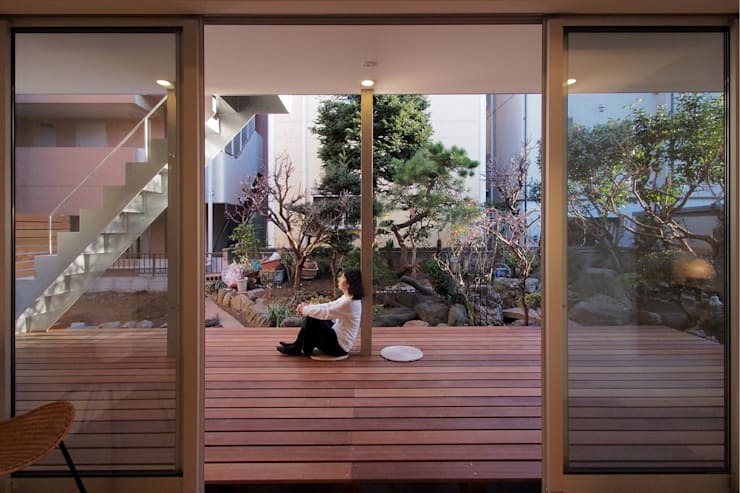 The courtyard rests in serene beauty, with a flowing, timber deck lining the living area before giving way to a gorgeous garden in traditional, Japanese style. The space presents the perfect locale to unwind in a tranquil atmosphere, for solitary contemplation or relaxed interaction with friends or family. To the left hand side we can see the sheen of a silver staircase, which provides external access to the property's upper level. Moving upstairs and we're met with another lofty and spacious living area, with plenty of light streaming through its windows and skylights, creating an uplifting atmosphere. 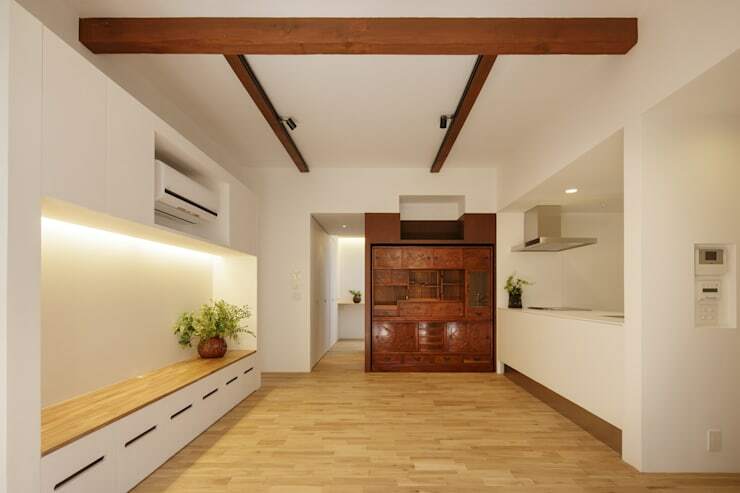 The prevailing decor of wood and white has been carried through on this floor, although the home's ceiling beams have been stained a cool grey, which gives off an almost industrial effect and introduces a subtle new design element to the overall aesthetic. The second floor of the property also includes a kitchen space and area for outdoor living. Dressed in white, this compact kitchen incorporates a small, wooden bar for casual dining and socialising. Bordering the kitchen is a cosy courtyard, which is drenched in light and presents a lovely, private space in which to enjoy warm weather and fresh air. Also traversing this dwelling's upper level is this uniquely decorated space with a rough, chip-board finish. This section of the home is again wonderfully lit, both through an array of small windows scattered throughout its high walls and through spotlighting included overhead. 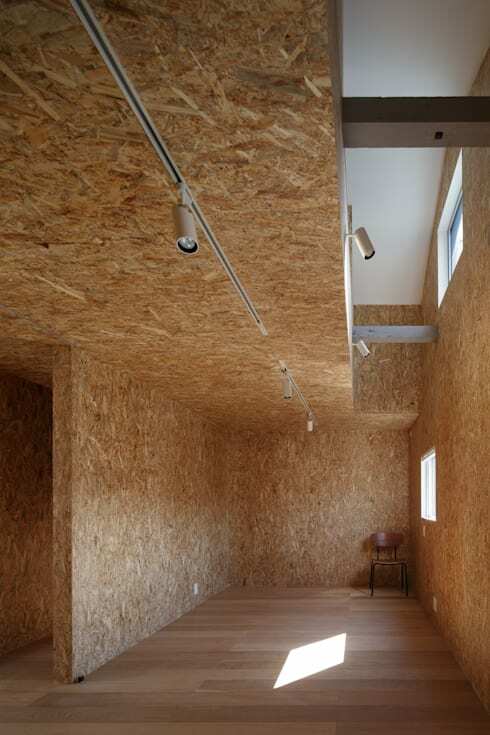 The chip-board sections present an intriguing aesthetic addition, and even flow upwards to construct a small attic space to be used for storage by the occupants. Did you enjoy the unique construction of this sleek, modern home? 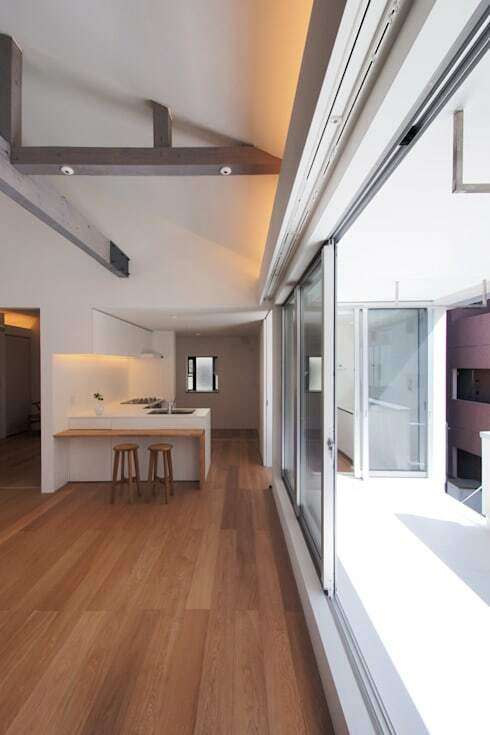 If so, take a tour of The 3D Box House Filled with Light for more design inspiration! What did you think of the chip-board sections of this unique home? Tell us below!